Featuring: Liv Ullmann, Daniel Bergman, Olivier Assayas, Ruben Ostlund, Mia Hansen-Love, Carlos Saura, Jean-Claude Carriere, Ingmar Bergman, Jr.
It’s Ingmar Bergman’s centenary, which means that the accolades and retrospectives of the Scandanavian master have been flowing all year. In fact, TIFF’s Cinematheque is in the midst of its career assessment of his work, with such films as the chilly “silence of god” tragedy Winter Light and the epochal Cries and Whispers screening this week. (Check tiff.net/bergman for details). What could be more appropriate than a new documentary on Bergman to complement the yearlong festivities? With Searching for Ingmar Bergman, the esteemed director and former actor Margarethe von Trotta has surprised cineastes with her desire to take on the Swedish auteur’s legacy. Von Trotta gained her reputation as a feminist director when she made her German New Wave hits Sisters (1979), Marianne and Juliane (1981) and latterly Rosa Luxemberg (1986), all of which concerned themselves with radical women and politics. Marianne and Juliane greatly impressed Bergman, who praised the film in print (as part of a personal top ten of films) and to von Trotta personally. Perhaps that explains why von Trotta wanted to make a doc on Bergman and why the film lacks the director’s customary rigour and intensity. Searching for Ingmar Bergman begins with the famous chess game between Max von Sydow’s Knight and the ultimate opponent, Death, in The Seventh Seal and soon moves into a friendly but hardly revelatory interview with the Swedish director’s favourite muse, Liv Ullmann. Both distinguished woman tacitly acknowledge Bergman’s promiscuity—over a lifetime, he had many muses—but don’t make an issue out of it. 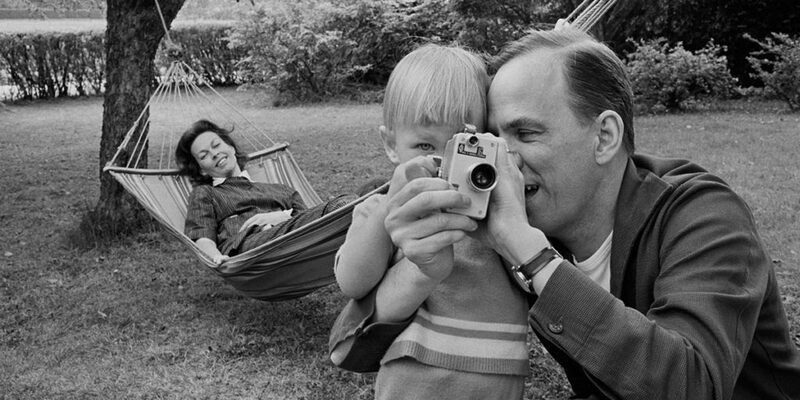 Nor is there much said about his inability to be a good father apart from a supportive interview with two of Bergman’s sons, Daniel and Ingmar, Jr., in which they talk about his failings but eventually figure him. The rationale that Bergman was a genius, who worked in a time when expectations of men were far different then they are today, is trotted out from time to time. A host of directors and scriptwriters praise him to von Trotta; among them are: Jean-Claude Carriere, Carlos Saura, Olivier Assayas and Mia Hansen-Love. The only genuine objection raised is by Swedish director Ruben Ostlund, who notes that Bo Widerberg was more popular in their own country than Bergman. Von Trotta never follows up with Ostlund as to why Bergman was little praised amongst the cognoscenti at home. One could venture that Bergman’s films were too self conscious and pretentious to draw praise in younger circles even while he was alive. In any case, the real question, which is never posed by von Trotta is: What has caused Bergman’s films to be so little studied and appreciated? Perhaps he’s too “old school”—conservative in film structure and overly serious in his philosophy—to be appreciated today. For someone like me, who loved Bergman for decades, it’s hard to admit that I now approach films like his Hour of the Wolf and The Virgin Spring with trepidation. What do his films mean to us today? Margarethe von Trotta proposes a search for Bergman in her documentary but I don’t feel that she’s found him. Perhaps he’s eluding us, waiting to come back at a time when he’ll be in favour again.